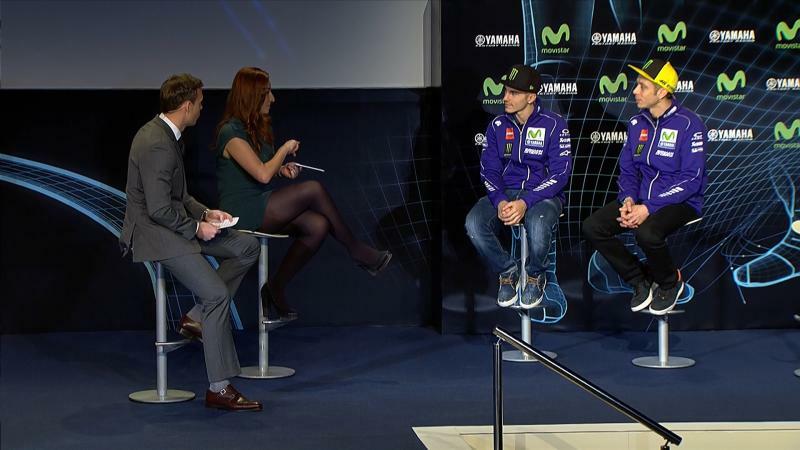 Movistar Yamaha MotoGP team were the first in MotoGP™ to officially unveil their 2017 line-up and livery, with riders Valentino Rossi and new teammate Maverick Viñales getting the season into gear in Madrid on Thursday. The Italian-based squad traveled to Telefónica headquarters in Spain in the last week of the winter break – before the first Official MotoGP™ test of 2017 kicks off at Sepang International Circuit in Malaysia on January 30th. In the last three seasons, Italian legend and nine-time World Champion Valentino Rossi has been a title contender, ending each year runner-up, and is now joined by a new face on the other side of the garage: 2013 Moto3™ World Champion Maverick Viñales. Viñales moves to Movistar Yamaha MotoGP for his third season in the premier class after having impressed on his debut with Team Suzuki Ecstar, including a race win at the British GP at Silverstone last season. Viñales also went fastest in the first testing for 2017 at the Circuit de la Comunitat Valenciana in November – something that bodes well for the incredible line-up to attempt to defend their status as reigning MotoGP™ Team World Champions; a title won in 2016 for a seventh time. 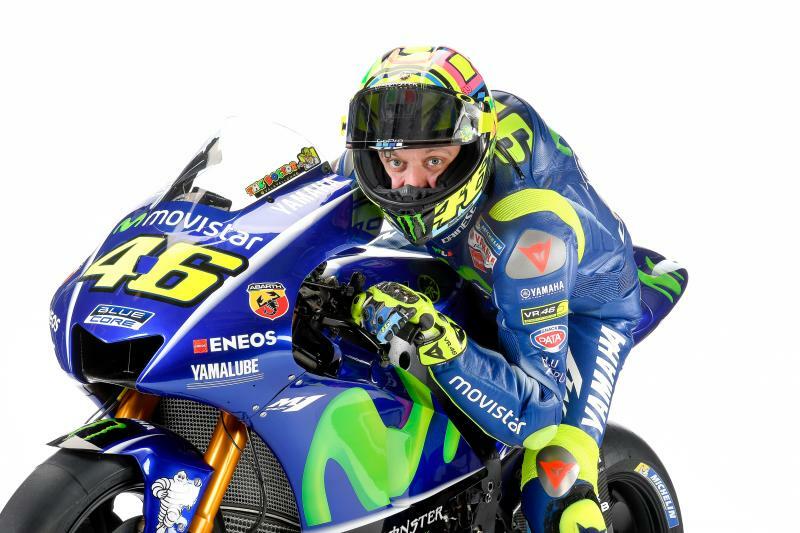 Valentino Rossi: “After the winter break, the team launch is always a very exciting time for everybody, not only for us, the riders and the team, but also for the fans. Sincerely, I’m just as happy as they are to start the new season, I have missed riding my bike. The pre-season test in Sepang will be an interesting moment, we will get a good idea of our level and it’s also the first time I’ll get to take the YZR-M1 out on track in its 2017 colours. Maverick Viñales: “After the test in Valencia and Malaysia I got off the bike feeling very happy because I was on the level I wanted to be at. The whole Movistar Yamaha MotoGP Team can’t wait to start the season because we know we can be at a 100% level and compete at the front. “Today we revealed the bike and it looks beautiful, I wish I could start riding it right now! When I was a kid, I used to watch Valentino riding his M1 and now I’m here at the team launch, it’s like a dream come true! I’m so happy and motivated and I’m ready to give it my all. 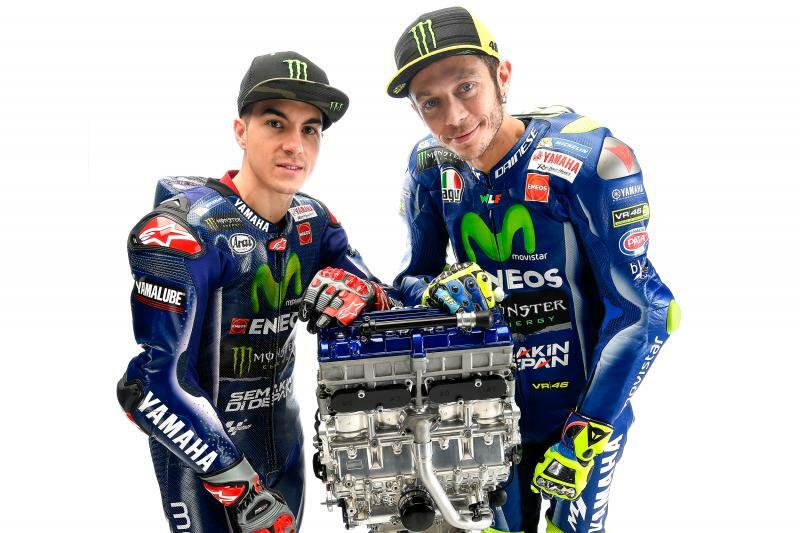 I want to thank Yamaha, Movistar and of course the team. They have welcomed me very warmly, so it is a great start to the season already. Presenting the 2017 team were Izaskun Ruiz and MotoGP™’s Dylan Gray, who welcomed Rossi and Viñales to the stage for a Q&A session. They were later joined by General Manager of Motorsports Division & YMC MotoGP Group Leader, Kouichi Tsuji, Managing Director of Yamaha Motor Racing, Lin Jarvis, and Movistar Yamaha MotoGP’s Team Director, Massimo Meregalli, who went into detail on the technical development of the bike as well as the new rider line-up and its promising prospects. Luis Miguel Gilperez, President of Telefónica España, was also in the spotlight and further explained Movistar’s strategy and its dedication to MotoGP - before it was time to reveal the bike. The ceremony saw the 2017 Yamaha YZR-M1 revealed in its new colours with a refreshed livery. As well as the new Movistar logo, the Blue Core logo is added as a new design element on the bike, while the deepened Yamaha blue gives the bike a chic finish. 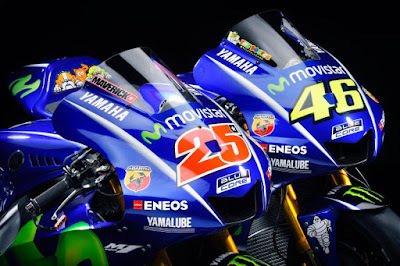 Further revelations include the new Movistar Yamaha MotoGP Team logo, with the Movistar ‘M’ in a more prominent role. The deepened collaboration between the two is also reflected in the YZR-M1’s 2017 livery, which features the new Movistar-logo on either side of the fairing and the front of the bike. 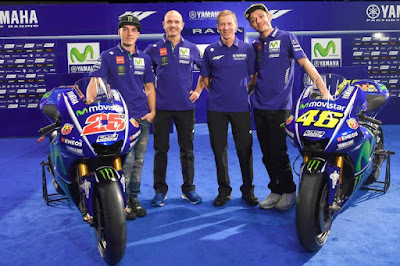 Yamaha Factory Racing and Spanish telecommunications giant Telefónica’s signed a five-year partnership agreement in the premier class of road racing in 2014, underlined with Movistar becoming the team’s title sponsor. In the past three years Yamaha and Telefónica’s shared values and passion for innovation laid the groundwork for success, resulting in a Triple Crown in 2015 and the Team Title in 2016. 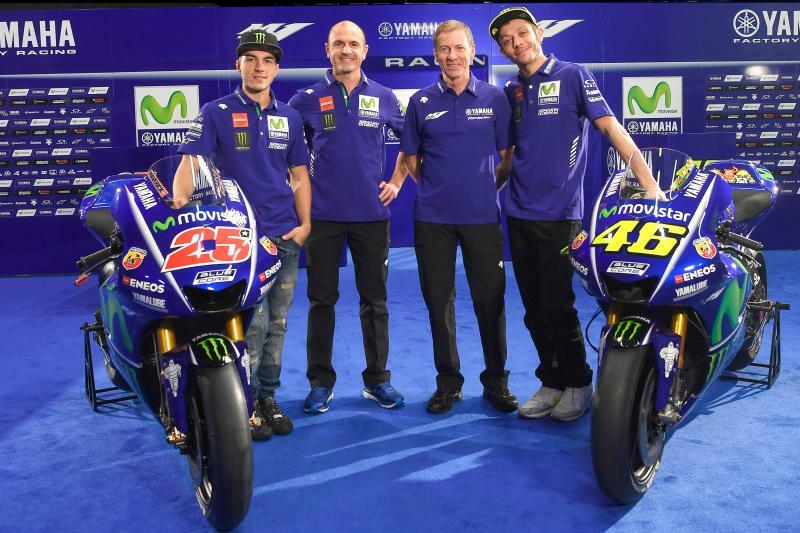 Lin Jarvis, Managing Director of Yamaha Motor Racing Srl: “Over the last three years we have demonstrated that our team is very competitive and our partnership with Movistar has delivered great results on and off the track. Movistar and Yamaha are both brands that have a lot of history in the MotoGP World Championship and we are proud that our collaboration is growing stronger each season. It therefore seemed no more than fitting to present the 2017 YZR-M1 at the home of Movistar, the Distrito Telefónica in Madrid. The bike’s striking new livery features cleaner lines, more blue and a very strong Movistar branding on the fairing. We also unveiled the new enhanced Movistar Yamaha MotoGP team logo symbolizing the partnership between our two companies. We see today not only as the official start of the 2017 season but also the start of a next chapter with our exciting new rider line-up; it is a new beginning and so Movistar’s slogan “We Choose to Make History” is certainly very fitting and one we will strive to live up to.